The Nestle Compleat Modified Tube Feeding Unflavored Food 250ml Each, Model #14010000, is anchored in advanced science and research. Nestle Healthcare Nutrition offers nutritional solutions for people with specific dietary needs related to illness, disease states or the special challenges of different life stages. 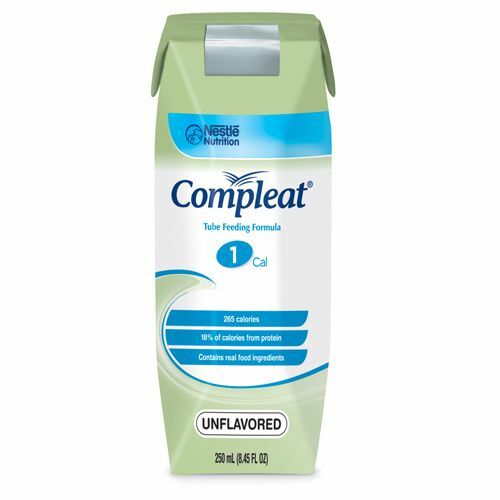 The Nestle Compleat Modified Tube Feeding Unflavored Food 250 ml Each is developed for patients who desier a real food component. This formula is a blenderized tube feeding formula with real food ingredients, including chicken and vegetables, plus soluble fiber to help support digestive health and normal bowel function. Compleat is a safer and more convenient alternative to blenderized, homemade tube feedings. Formulated with real food ingredients: chicken, peas, carrots, tomatoes and cranberry juice. Fiber blend helps support digestive health and normal bowel function. Closed system with SpikeRight PLUS port, the first available proximal-end enteral connector incompatible with IV equipment. May help address feeding intolerance common in individuals with development disabilities. Long term tube feeding regimen for those who desire a real food component. Ingredients: Water, Maltodextrin, Corn Syrup, Chicken Puree (Water, Dehydrated Chicken), Sodium Caseinate (from Milk), Carrot and Pea Puree (Water, Dehydrated Carrots and Peas), Tomato Puree (Water, Tomato Paste), Canola Oil and less than 2% of Cranberry Juice (Water, Cranberry Juice Concentrate), Partially Hydrolyzed Guar Gum? (Soluble Fiber), Potassium Citrate, Calcium Phosphate, Salt, Hydroxylated Soy Lecithin, Sodium Ascorbate, Choline Chloride, Magnesium Oxide, Carrageenan, Magnesium Phosphate, L-Carnitine, Taurine, Alpha-Tocopheryl Acetate, Zinc Sulfate, Ferrous Sulfate, Niacinamide, Calcium Pantothenate, Vitamin A Palmitate, Copper Gluconate, Manganese Sulfate, Vitamin D3, Pyridoxine Hydrochloride, Riboflavin, Thiamine Hydrochloride, Beta Carotene, Potassium Hydroxide, Citric Acid, Chromium Chloride, Folic Acid, Biotin, Sodium Molybdate, Potassium Iodide, Sodium Selenite, Phytonadione, Vitamin B12.